The Ecosan composting toilet prevents disease and promotes health, protects the environment and conserves water, recovers and recycles nutrients and organic matter. Ecosan is a shortened term for ecological sanitation. It refers to a system of human toilet systems which separate solids and liquids at source, safely and in a hygienic manner without causing pollution; and uses the nutrient value contained in the waste for growing plants. Typical sanitation solutions have included the septic tank or simply a pit latrine. Both tend to pollute ground water and are environmentally unsatisfactory. The Ecosan method consumes less than a litre of water per day for a family, converts human waste to a fertilizer resource, is clean, hygienic and functional and can be constructed almost anywhere irrespective of high water tables, hard rock below the ground or any other conditions that might prevent the construction of regular toilets. By harvesting rain water from the rooftop of the toilet into a 200 litre drum all the water requirement of washing in the toilet can be met by the toilet roof itself. 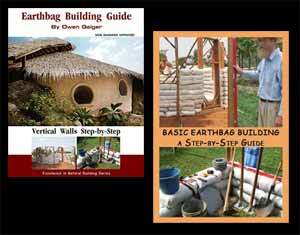 For a detailed description on how the Ecosan method works, see this PDF. The Indian style Ecosan pan is designed with three openings. One for the urine, one for the solids and one for cleaning your bottom. The solids are covered with ash or sawdust or any organic material. This ensures no smell. There are no problems of flies, gnats or insects. The urine is collected in a plastic jug and after dilution with water in proportions of 1 to 3 or 1 to 8 can be used for plants, especially trees, where it makes a good fertilizer with its high nitrogen content. The faeces is collected in a bucket or tin box, and once this is full it is replaced with another. The full box is allowed to compost for 3 weeks and then transferred for further composting to a composting drum or compost pile. For washing purpose you can use a ‘tippy tap’ water saving hand washing system. Can you please give the dimensions of the toilet and the cost of it. Thanks for the information. 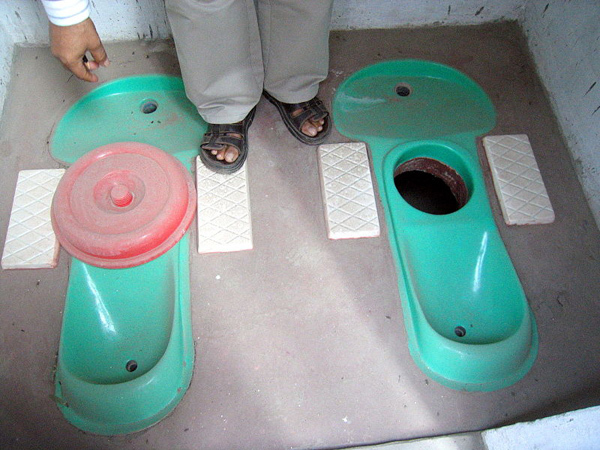 I’m curious about composting toilet use, and especially availability, around the world. Many producers seem to come from Sweden, with the U.S., Canada and Australia as large markets. What about everyone else? Everyone else can use a sawdust bucket toilet as designed by Joseph Jenkins. It’s the cheapest, simplest eco toilet in the world. I am very intrigued about these toilets but cannot find any source for being able to purchase one. Anyone by chance know a distributor to purchase on from? I heard one manufacturer is in Bangalore, India, but never found a website to order from. They’re made in other countries as well according to the Wiki article. The writer of ‘The Humanure Handbook’ suggests composting liquid and solid wastes together. For those of us who don’t want to go in a bucket, no matter how dressed up it is, I’ve been thinking about how to make a composting toilet flushable. I’m thinking a small vacuum pump, a heavy gauge stainless steel pipe for both vacuum chamber and waste disposal, running into a compost bin on the exterior of the house. When you flush, a small amount of water (perhaps a cup) is added to solids, a valve opens and air pressure shoves the waste down the pipe to the bin. Seal is maintained on the bin end with a butterfly type valve with a spring close. The pipe should slope downwards for both drainage of any remainder and maintenance concerns, and shouldn’t point directly at any access point to the bin, as the waste may attain some velocity. Cover material could be added either manually by opening the top of the bin and throwing some on, or could be automatic. Noise and vibration may be an issue. While it would take electricity to run the pump, it would require far less water than a conventional system, and would be far more likely for an average American to use.